Cebu Pacific Promo Fare: Hating Ka-TIPID! 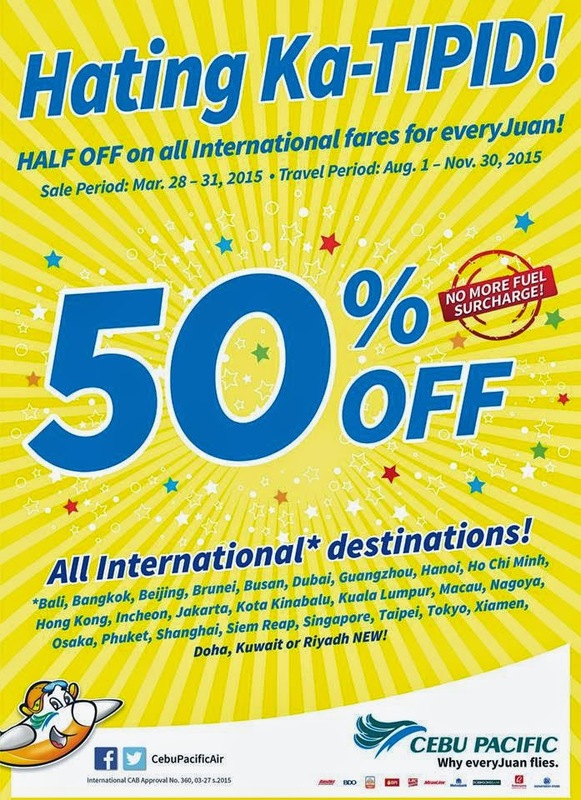 HALF OFF on all International fares for everyJuan! Unlike in the past decades, most of us have the capacity now to travel abroad. Experiencing the cultures of other countries. Meeting boundaries. This latest promo from Cebu Pacific gives you the opportunity to travel at half the price!!! So what are you waiting for? Book your flights now! Quoted DOMESTIC one way fare is inclusive of Base Fare, Php 120 Web Admin Fee, 12% VAT, Php 200 Terminal Fee for flights transiting in or exiting from Manila/Cebu Station and 7 kg hand-carry baggage allowance, but exclusive of Fuel Surcharge ranging from Php 200 – Php 550 and check–in baggage. Terminal Fees ranging from Php 50 – Php 200 for flights originating from non-Manila / non-Cebu Stations must be paid at the airport. Quoted INTERNATIONAL one way fare is inclusive of Base Fare, Php 120 Web Admin Fee, and 7 kg hand-carry baggage allowance but exclusive of International Terminal Fees ranging from Php 450 – Php 550, Php 1,620 Philippine Travel Tax, Fuel Surcharge ranging from Php 420 – Php 2,195, Country Specific Taxes ranging from Php 403 – Php 1,250 and check-in baggage. Fares are non-refundable, but rebookable subject to Php 1,200 for Domestic destinations, Php 2,000 for International short-haul destinations and Php 2,500 for Dubai plus fare difference. For your convenience, flight changes, availing of prepaid baggage allowance for check-in baggage and web check-in service can be done up to 4 hours before your scheduled flight. Only available ONLINE at www.cebupacificair.com, except for International Long-Haul routes which may be availed from all Cebu Pacific sales channels.